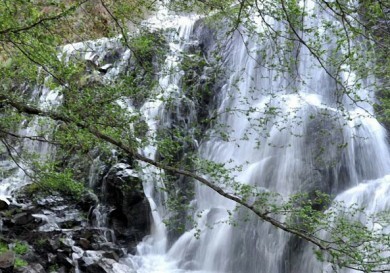 The mountains, the solitude of the monasteries and the beauty of the valleys…. 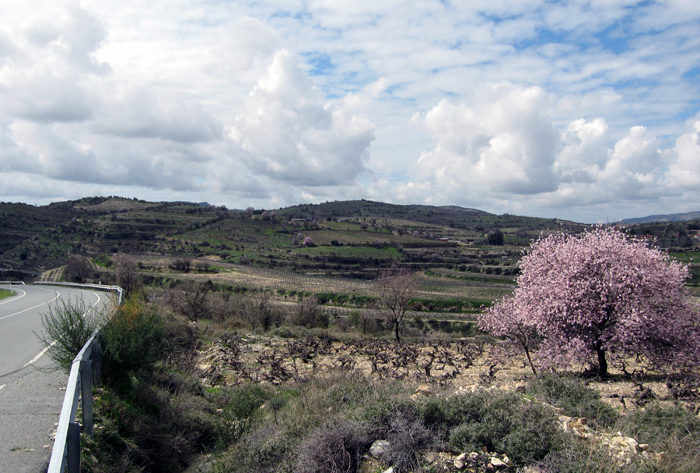 This is one of my favourite routes: Paphos – Omodos – Platres – Trooditissa – Platres – Pera Pedi – Limassol. I will note the distance in units of time rather than in kilometers so that you can easily alter the route to suit your needs. For many the main aim of a holiday is to relax and not to tire ourselves out too much. I leave Paphos at 10.30 on a sunny Sunday morning when the roads are quiet. After about 20 minutes I turn left towards the village of Avidmou. The route lies through the sheep breeding area and the road is fenced off on both sides. If you are travelling with children they will enjoy seeing the animals. We drive along the outskirts of the town and catch a glimpse of the narrow ancient streets winding away from the road. The area becomes more and more charming, and in winter the slopes of the mountains are covered with green grass, reminding me a little of Italy. 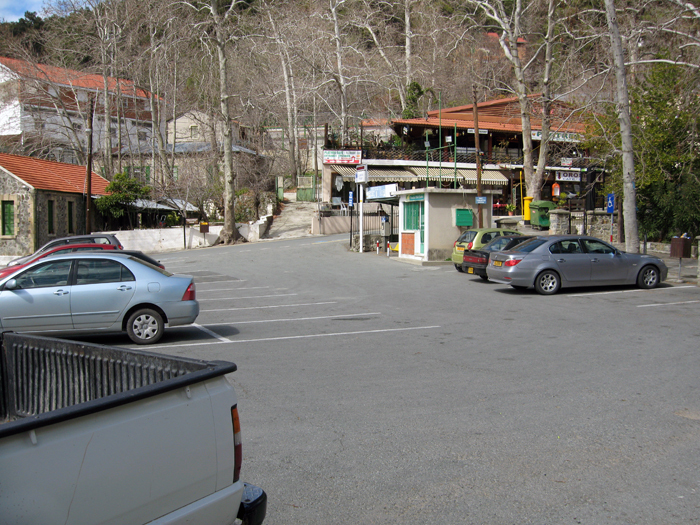 After about 25 minutes we arrive at Omodos, the ancient town hidden in a valley amongst the mountains. I recommend the story “The Charm of Omodos”, which will provide the history of the place for those interested. We are moving now down towards the valley and follow the signs to a car park. There is usually ample parking available here and the car park is only about 50 metres from the centre of town and the monastery of the Holy Cross. 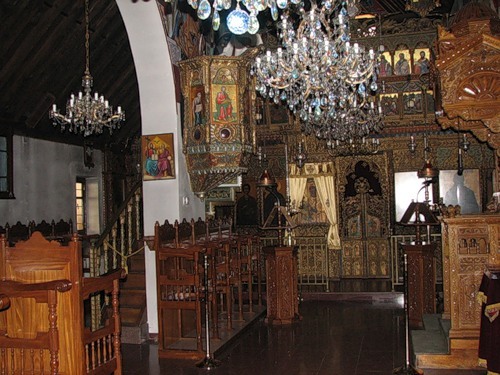 The monastery is not operational nowadays, but the church is open and here they hold the Christian shrines – particles of God’s Cross (the very cross on which Jesus was crucified), and Christ’s Bonds (which tied the hands of Christ when he was led to be executed). According to the 18th century Russian traveler, Vassily Barsky, the Saviour’s blood stains are preserved on the bonds. These shrines arrived on the island in the 4th century. Tsarina Yelena, the mother of the Byzantium Emperor, Konstantin the Great, left for the Holy Land (what is now Israel) and found God’s Cross. 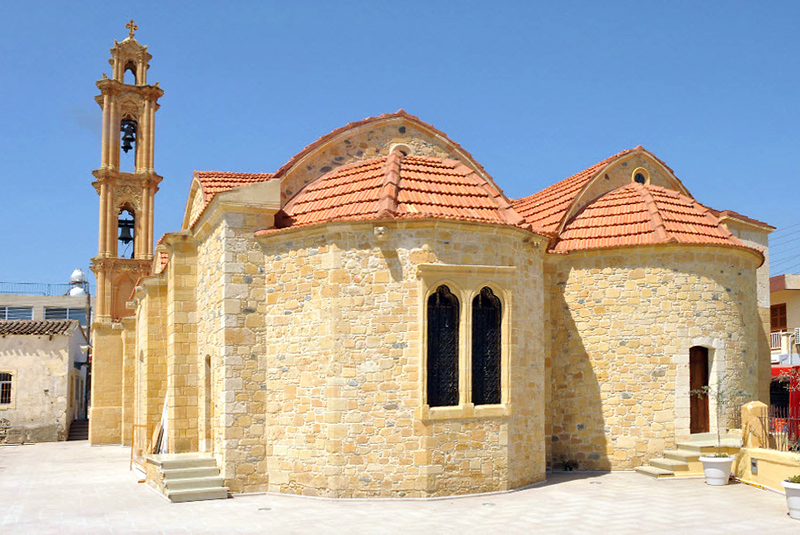 Her return journey took her through Cyprus which is how the shrines arrived here. This is why the names “Stavros” (the cross) and “Stavroula” are so popular in Cyprus. 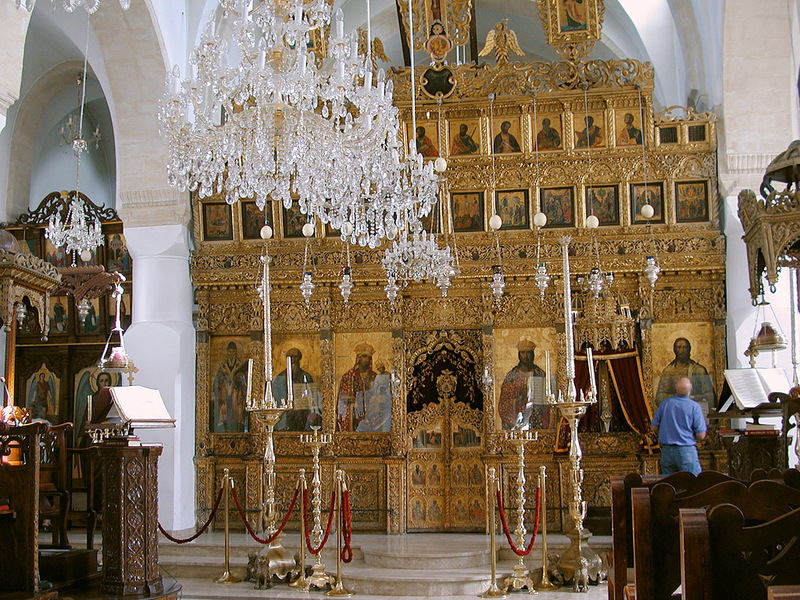 The shrines are inside two crosses which can be seen in an iconostasis to the right of the Holy Doors. Many of the icons in the iconostasis are painted by Russian craftsmen. Entering the church from the western entrance, opposite the iconostasis, you will see the northern entrance which is usually open. Next to this is the reliquary with the remains of the apostle Philip, Saint Nicholas and the martyr, Tryphon to name a few. 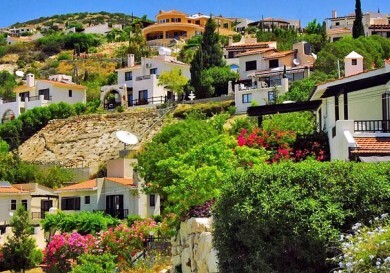 Omodos is a small village with clean, narrow streets winding ‘round the ancient stone houses. 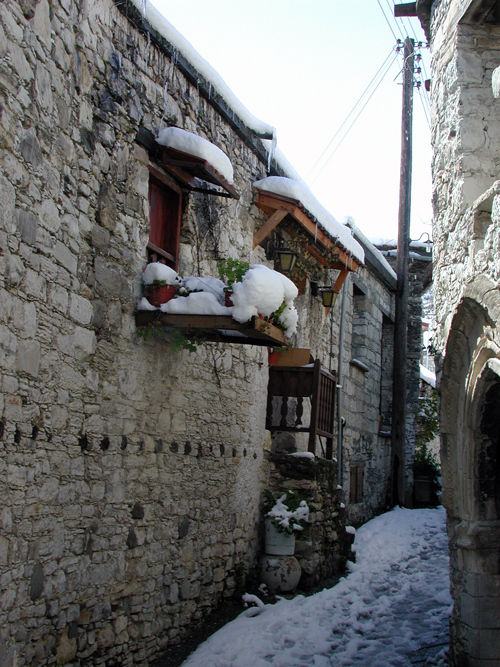 Omodos is especially beautiful in winter when there is snow, but all year ‘round you will see the Cypriot ladies selling their wonderful handmade lace, napkins and tablecloths. There are also interesting handmade silver items, souvenirs and, of course, wine. 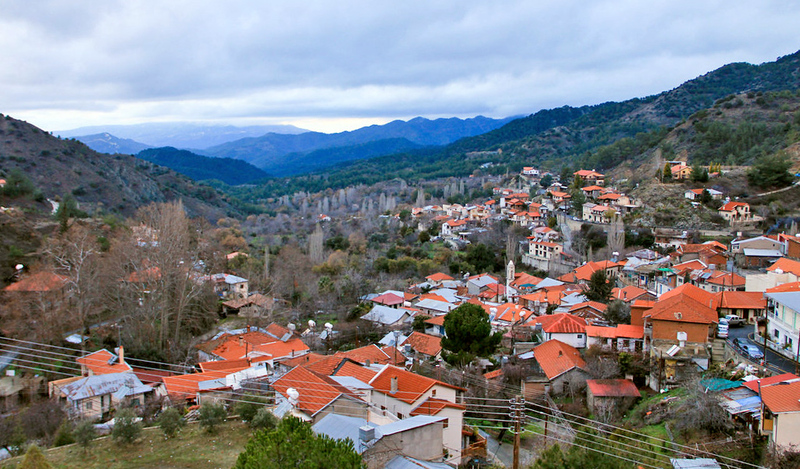 Omodos has long been a centre of wine making. Are you hungry? Father Yannis’ restaurant is well known and the lunch I had there was quite good. It’s now time to make our way back to the car and continue our journey. After about 10 minutes we come to Kato (lower) Platres. The road climbs and in 5 minutes we find ourselves in the centre of an elegant village. The narrow road winds higher and higher between the mountain slopes, which hug the terracotta roofed houses. Sometimes you will see a plot of land that is on a steep mountain slope with the road running along the upper part. The house is built from the top downward, as if leaning on the rock. Cars and pedestrians pass by above, and the house appears to be frozen above the valley. There is an amazing view of conifers and the deep gorge and only a small fence separates the garden from a sheer drop down the mountain. We are now following the road signs and travelling up towards the amazing Trooditissa monastery. It’s only a 15 minute drive, but care should be taken on these steep, winding roads. The monastery doesn’t encourage visitors so it’s never overcrowded here. If you just want to sightsee then it’s better not to visit, but if you are there to see the icons of the Most Holy Mother of God and enjoy the sanctity of the place then the monks will not prevent you from doing so. It’s as if time has stopped and you are enveloped in the silence. 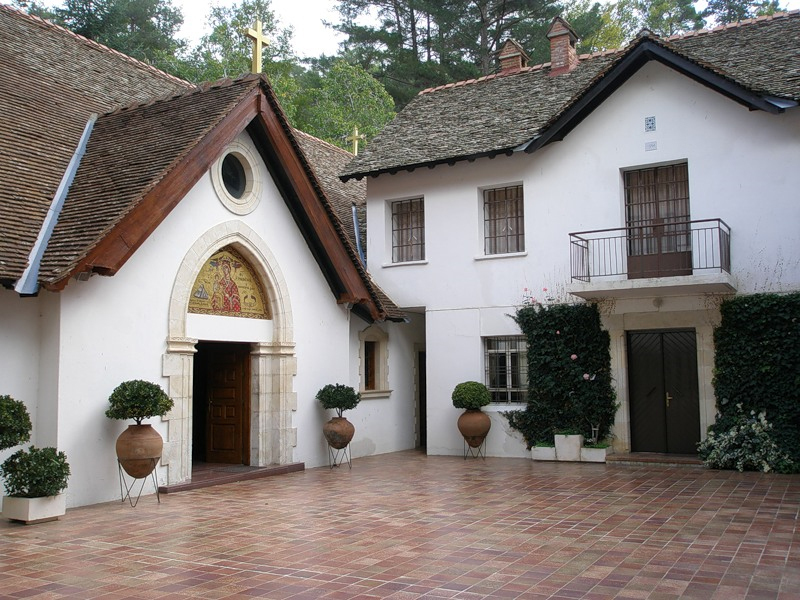 You enter a small inner yard, always perfectly clean, and you will see an entrance to the church in front of you and an icon shop to the left, where there is usually a monk on duty. Entering the semidarkness, it’s even quieter here. An icon of the Most Holy Mother of God takes place of honour in the iconostasis, to the left of the Holy Gates. There are many stories as to how the icon was acquired, whilst the monastery dates back more than 1,000 years according to some sources. The monastery was first mentioned in the 14th century, while the newer buildings were constructed in the 19th century due to fires which destroyed the building several times. The icon was always saved, by a miracle. The second shrine is a miraculous belt. Legend says that one pious Christian could not conceive so she prayed to the Most Holy Mother of God and her pleas were heard. After giving birth to her long-awaited first baby, she bequeathed her expensive belt, decorated with gold and silver, to the monastery. Today there is a rite in the convent where the belt is worn by a woman who cannot have a child, and a special prayer is then read. The monastery keeps a box with pictures of happy mothers and their babies, brought from different countries and continents. There is a picture of our eldest daughter there…. Ask if you can buy some apples. The monks grow amazingly tasty apples that ripen at the end of summer/beginning of autumn and are kept for a long time in cold storage. We are now driving down to Kato Platres. 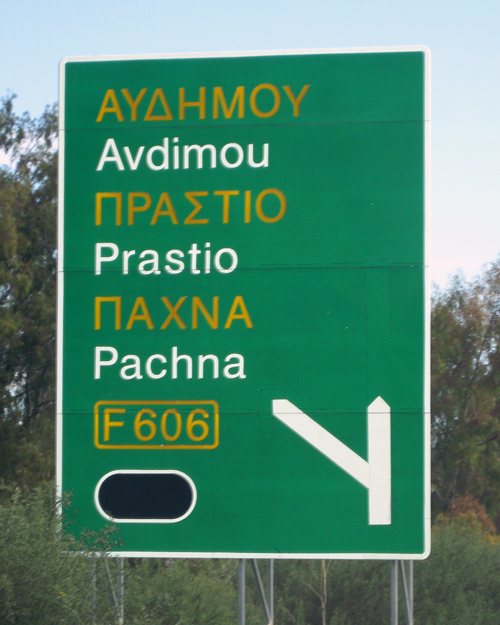 Those going to Paphos will turn right at the junction, whilst we are carrying on straight towards Pera Pedi. Take a minute to drop in to the Constantinou winery and also the Neromilos Restaurant, which I can highly recommend. Carrying on, we leave Pera Pedi and after about 20 minutes we are back on the main road which connects Limassol and Troodos. 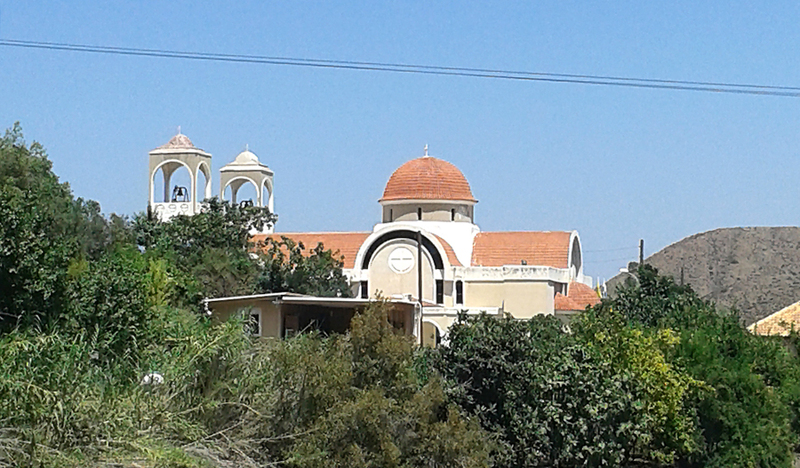 We turn right towards the village of Trimiklini and after about 25 minutes enter Limassol. 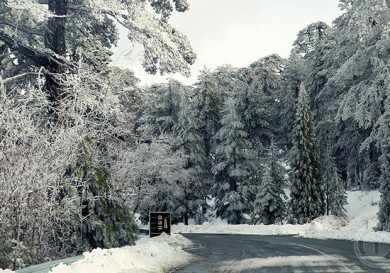 By the way, it only takes about 15 minutes to drive from here to Avdimou where we started our journey. I hope you are not too tired and still want to travel. There are many more amazing places in Cyprus which are well worth visiting.